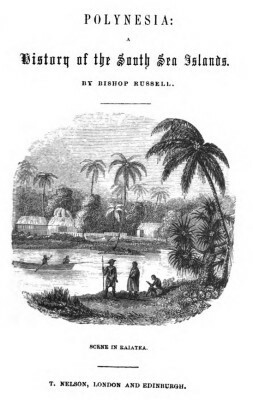 Bishop Russell : Notes on Surf-riding Prohibition, 1836.
including New Zealand; with narrative of the introduction of Christianity, & c.
time in the Sandwich Islands, as well as in those of the Society group. His information comes down to the year 1836, since which period there has not been any material alteration either at Otaheite or Woahoo. Some visiters lament that the missionaries, while they have improved the morals of the people, have so far broken in upon innocent habits, as to render them less cheerful and less attentive to personal cleanliness. Formerly they had numerous games, such as running, wrestling, and throwing the spear; but these have been generally discontinued, as being either too nearly allied to their idolatrous usages, or tending to encourage a spirit of gambling. The consequence is, that their manly sports have ceased; even swimming and bathing are in a great measure prohibited; and hence, it is alleged, whatever the Sandwich Islanders may have gained in the way of religious improvement, they have certainly lost much of their personal neatness, masculine character, and, more especially, of that dexterity in bodily exercise which formerly distinguished them. "Too much cannot be said in favour of the missionaries, for the successful efforts they have made to civilize and educate the natives; but it is to be regretted, that their zeal too often carries them into extremes, the result rather of sectarian prejudice than of true religion. Hence a native is punished if he should be seen on horse-back, or making a fire, or cooking a pig on Sunday.
" I received your kind note last evening, together with the accompanying memorandum, for all of which 1 beg you will accept my very grateful acknowledgments. "For the frank and friendly manner in which you have expressed your views with respect to our work and the state of the people, for the valuable hints you have given relative to the improvement of the nation, as well as for the uniform gentlemanly deportment you have exhibited to the gentlemen with whom I have the happiness to be associated in the missionary work, my brethren join with me in tendering you our cordial thanks, and the assurance of our kind wishes for your best prosperity. prohibition, by authority, of the innocent amusements of the people. We certainly are not aware that the healthful exercises of swimming, riding on the surf-board, or on horseback, or any athletic exercises to which the people are attached, disconnected with immorality, are prohibited. In these exercises we would allow and encourage our own children, and certainly we would not have force employed to restrain the people. with narrative of the introduction of Christianity, & c.
Geoff Cater (2017) : Bishop Russell : Surf-riding Prohibition, 1836.